Your body is smart. But it does not necessarily know what to do with the chemical compounds manufacturers have been adding to their products (or making the basis of their products) over the past several decades. And whether that newfangled chemical stuff is entering your body through your food, personal-care products, or household goods, the net result can be nasty. Your body is a creative problem solver, though. So it might stash some of those chemicals in your fat cells. It might try to exude them through your skin. Or it might try to flush them out in your body's waste streams (think sweat, urine, poo). But all of that requires some doing on the part of your body. And a lot of things can go wrong along the way. Like what, you ask? Well, some of those chemical compounds can irritate and inflame your body's tissues (causing anything from skin rashes to gut leakage). They can also contribute to your body's toxic load or "body burden," which in turn puts an extra strain on your organs and immune system. Some chemicals, known as neurotoxins (including many found in artificial sweeteners, colors and flavors, and preservatives), can mess with your brain and nervous system, causing severe headaches and fatigue, as well as mood and behavior problems. Some compounds, known as endocrine disrupting chemicals (or EDCs for short), can mimic or confuse your body's hormones, interfering with normal sexual development and reproductive function, and increasing the risks for certain types of abnormal growths (such as fibroids) and cancers. A subclass of EDCs, affectionately known as "obesogens‚" can alter both appetite and metabolism, causing weight gain. Obesogens were recently named an "emerging threat to public health" in a research review published by the American Journal of Obstetrics & Gynecology. You might be thinking: But surely there's no way that our government would allow anything but 100 percent safe and carefully tested chemicals in our food and body-care products! Isn't that what the USDA and FDA are for? Here's the nicest way I can put this: In principle, yes. In practice, alas, not so much. The problem is that the majority of chemicals used in conventional body-care products have never been tested for long-term safety. And even those studies that have been done on chemicals used in brand-name food and household cleaning and furniture products typically screen for evidence of immediate toxicity, not necessarily for the effects of repeated, long-term, or combined exposures. In truth, even if our regulatory agencies tried harder, it would be almost impossible for them to study how all the various intermingling chemical compounds present in countless foods, cosmetics, and personal-care, cleaning, and household products might interact in the complex and constantly changing petri dish of the human body. We are talking about thousands of chemicals here, and an almost endless number of different exposure scenarios. It's worth noting that many of the chemicals that are widely used here in the United States are banned in the European Union. That's because European manufacturers are required to observe what's known as the Precautionary Principle, which dictates that chemicals must be presumed potentially dangerous until proven safe. Here in the United States, we operate on the opposite assumption, regarding most chemicals as safe until they are proven dangerous. The problem with this strategy, of course, is that it turns U.S. consumers into guinea pigs -- unwitting subjects in a long-term "study" with a variety of negative implications for human health. The net result: Most of us have our bodies bathed, inside and out, with potentially dangerous industrial chemicals on a daily basis. Some of those chemicals are routinely found not just in the blood and tissue samples of virtually all U.S. adults, but also in the umbilical cords of newborn babies. Make whole foods the center of your diet. Choosing single-ingredient whole foods and drinking simple, homemade, unsweetened beverages (like water, tea, and coffee) spares you from ingesting a great many chemical-laced ingredients and additives. Eating fresh or frozen whole foods also lets you avoid a lot of chemical preservatives (you'll still want to wash or peel most produce, though, as it may have been sprayed or waxed or otherwise come into contact with chemical residues during storage and transport). Choose foods grown and raised in healthy environments. You want your food as free as possible from chemical pesticides, herbicides, antibiotics, and heavy metals. Certified organic and biodynamic foods are a good start, but you can also choose foods from growers whose methods you know and trust, or consider growing some of your own. Be aware that both wild and farmed fish, seafood, and meat products will typically contain traces of any chemicals or other pollutants present in those animals' food and living environments, so choose your meat and seafood sources carefully. Use cleaner personal-care and household products. 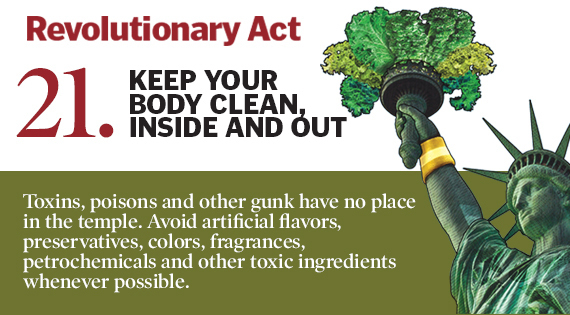 Whatever goes on your skin, hair, lips, and nails -- along with pretty much everything else you touch, wear, or breathe -- ends up on the inside of your body. So take a close look at the products you are using on yourself and in your home. Weed out conventional, chemical-laden products in favor of certified organic, simply formulated, plant-based, or homemade options. Avoid dry-cleaned, flame-retardant, and other chemically treated fabrics: The chemicals used in those processes, along with nonstick coatings and plastic food-storage ingredients, are among the most commonly found in human blood and urine samples. Read ingredient labels carefully. Many products marketed as "natural" -- or that use the word "organic" somewhere on the label -- still may contain a host of troublesome ingredients, like parabens, phthalates, artificial fragrances, dyes, pigments, and petroleum byproducts that are anything but wholesome. Study up. The list of problematic chemicals is constantly evolving. For the best current guidance, check out the Environmental Working Group's handy guides to cleaning up your food, personal-care products, and household goods. Don't trust a "seal of approval" unless you know what it means. Do a seasonal detox. Following a simple, whole-food detoxification program a few times a year can go a long way in helping your body dump what it doesn't want and repair the damage done by toxic compounds. Commit to keeping your body's elimination channels working smoothly on a daily basis by eating plenty of fiber-rich, colorful produce and drinking plenty of clean water. Final suggestion: Don't panic. Once you've done what you can to reduce your chemical exposure, stop obsessing about it. Yes, our world is full of toxins. But stress and anxiety produce toxic chemical byproducts of their own. And the only one who can keep those out of your system is you. "Beauty Beware" -- The not-so-pretty truth about toxins in most personal-care products, and how to avoid them. "8 Hidden Toxins: What's Lurking in Your Cleaning Products?" -- How to spot the potentially dangerous chemicals in your cleaning arsenal. "How to Detox Your Life, Save Money, and Change the World" -- Stacy Malkan's 10-point guide to lightening your toxic load. "Fast Track Liver Detox" -- A healthy way to help your body ditch toxic gunk, drop unwanted weight, and feel better than you have in years. Pilar Gerasimo is a nationally recognized healthy-living expert, author of A Manifesto for Thriving in a Mixed-Up World, and the creative force behind the 101 Revolutionary Ways to Be Healthy. She is currently working on a book about the art of being healthy in an unhealthy world. Learn more about Pilar's work and connect with her via social media at PilarGerasimo.com.